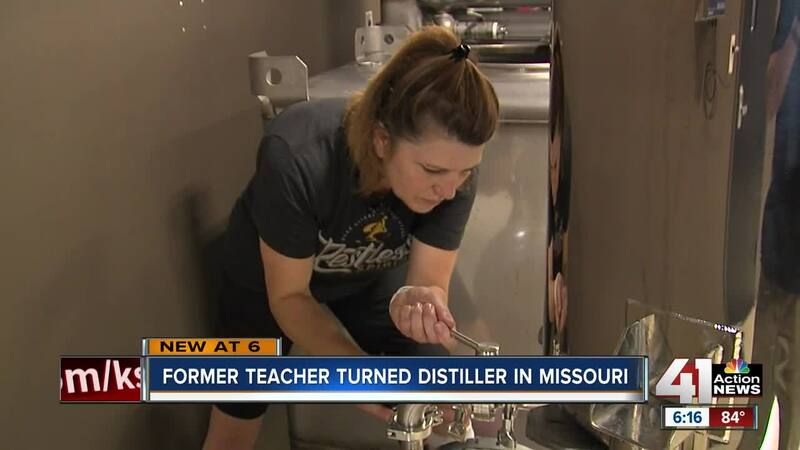 Benay Shannon, a former science teacher at Park Hill South, is the first female distiller in Missouri. Her former teaching skills come in handy at her new job, which she says came about mostly by accident. KANSAS CITY, Mo. — When you hear Benay Shannon speak, you can almost hear the science teacher come out in her words. "Give it a good stir," she said on a recent workday, "to make sure it's an even mixture all the way through." She could easily be talking to freshmen at Park Hill South. "It's just a matter of separating molecules," she said. These days, though, Shannon no longer teaches teenagers. She makes whiskey and gin. Shannon is the only female distiller in the state of Missouri. "Really, distilling is just a matter of separating molecules from each other," she said. Her past teaching comes in handy when explaining her work. This new job came about sort of by accident. "My husband and his friend got this wild idea and thought, let's start a distillery. He has all this experience with sales and marketing and brand developing, so he was able to envision this brand and create the ideas for these spirits," she said. Shannon's husband had all the vision but didn't know how to create the spirits. He asked his science teacher wife if she could help. "I said, 'well that sounds interesting. Let's give it a shot,'" she said. The Restless Spirits distillery is in North Kansas City. It’s been there since 2015, and business has steadily grown. Shannon said she likes everything she makes. "Because if I don't like them they don't go in the bottle. One of the prerogatives I guess of being a distiller," she said with a grin. She does admit, though, she has a few go-to drinks: her Builders Botanical Gin and her Gulleytown. "The Builders Gin margarita. Amazingly simple because you take margarita mix and you take Builders Gin and you put them together and that's it," Shannon said excitedly. Margarita mix sold in a liter and the Builder's Gin in a 750 ml bottle together make the perfect pitcher of margaritas, she elaborated. She also likes a gin and tonic. She'll muddle a strawberry in the bottom of a glass, then add gin and tonic and a little lime. As for her Gulleytown whiskey, she usually has someone make her an old fashioned. "I'm not a mixologist. I usually have someone make my cocktails for me," Shannon said with a chuckle. "I can put stuff in the bottle, but when I have to take it out, I'm a disaster." Visit the Restless Spirits website to learn where you can find it and how you can volunteer to help hand-fill bottles.